In a recent post about flock favorites I explored Toby’s obsession with her “papa”, who she would like to be with at all times. Things have gotten a little better since then, she’s been much friendlier to me when we’re alone, and even when we’re all together I’m able to get a bit more love. Unfortunately, Kelly increased her obsessive budgie behavior and spent a couple of days “grounded” so we could all take a break. Although, if I’m being honest, it’s just as much Toby’s fault as it is Kelly’s anyway. Here’s the vicious cycle that we can’t seem to break. Toby comes out of her cage and goes to sit on Patrick’s shoulders immediately, she is very happy and sings to his ears, grooms his stubble etc. Kelly emerges from her cage and wants to be with Toby with great intensity. Kelly flies to Patrick’s shoulders and is seen as an aggressive interloper by Toby, who fends her off repeatedly. Instead of taking the hint that her presence is unwelcome, Kelly grows increasingly intent on being with Toby. Toby becomes more and more violent and attacks Kelly, then chases her around the house attacking her until they are both worn out. No one is happy or having their needs met! 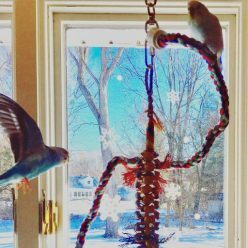 Humans included, because witnessing vicious budgie fights is stressful and alarming. We had a few bad days where some beaks got nicked up and they really could have hurt themselves fighting mid-air and crashing into things. It’s just an untenable situation. Thinking about it logically, Toby is the problem. She’s the aggressive, territorial, mean girl. But, we can’t ground Toby and let Kelly out in the same space. Kelly is so Toby-obsessed that she will cling to Toby’s cage and let Toby bite her feet. Additionally, and I’m a little ashamed to admit it, Kelly is not a lot of fun to hang out with. She’s not super human-friendly and bites us, she’s only happy if she gets her way precisely. So, if you try to stop her from painfully biting at your freckles she just escalates and bites the sensitive skin near your underarms. So, Kelly took a break for a couple of days so we could all get some rest. She didn’t take it particularly well and looked very sad trying to break out of her cage and just generally acting miserable. In fact, she was originally going to take a full week break and I’m the one who broke and let her out after a couple of days. I should add that she has a flight cage all to herself so spending a week in there is not cruel and unusual punishment! We are getting very close now to adding our boy to the flock and I am keeping my fingers and toes crossed that he and Kelly bond and Toby can just be part of her human flock without feeling like Kelly is always trying to be too close or steal her people. Obsessive budgie behavior is no fun for anyone. Has anyone else out there dealt with this sort of triangulation? Is there something else I can do? Hi, sounds like you are having a hard time. Introducing a male might help you to relax the situation. There is a possibility though you might have to add a second male. It will be most peaceful if the ratio male/ female is equal to avoid the fighting. It might also be a good idea to find an older male. 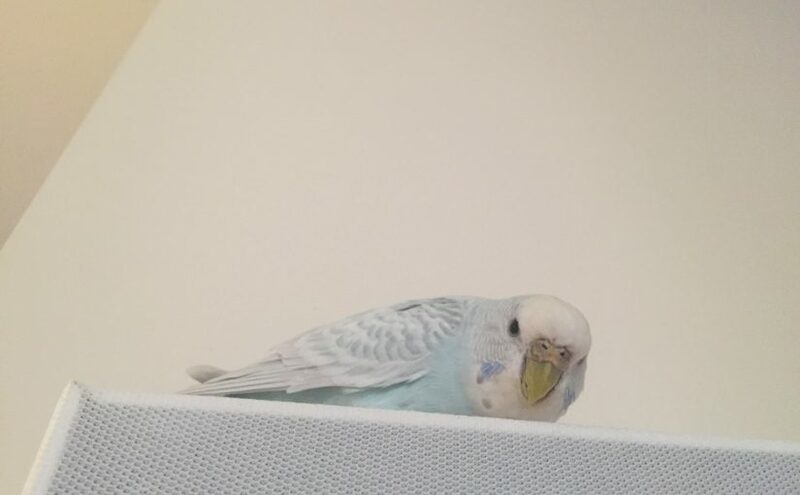 My last set of budgies had the male die and I got another, younger companion for my girl, which was a baby and the girl was just horrible to him. I guess it is nature and the ladies are dominant, but for an inexperienced male that can be really stressful as she “bullied” him and he just didn’t know how to hold his ground until quite some time later. I now have a pair of equal age boy/ girl and their relationship is very different. There are always “discussions” going on but overall they get on well and are sweet with each other (I was going for two males as I don’t want to breed and find males make easier pets… but one of the males turned out to be a female… (oh well). You wan’t to quarantine him for a while anyway when you get him to avoid bringing in diseases. Good luck! I will keep following the progress, I really like your blog! Hi! Thank you for reading and commenting! I would love to add two boys, I’ve heard they do best in even numbers/sexes, especially with girls. I’m get stuck weighing what’s best for the flock against what my husband is okay with. He has crazy allergies and he’s really wary of adding more than one. When Toby and Kelly molt is already tough for him so I don’t want to push it by adding 100% more feathers. Although when we started with budgies he insisted “only 1” and now I’ve got him up to a possible max of 3 so we’ll see. I’m glad you mentioned your experience with bringing in a younger male – I’m hoping to find a more mature fellow, both so that I’m absolutely sure it’s a boy (I cannot take one more girl haha!!) and so that he can hold his own against my tough girls. Not that I expect violence, but they are definitely dominant. Planning on a 30 days quarantine in as separate an airspace as possible. I’m thinking that it’s a good idea not only to avoid infecting Toby and Kelly with something but also to give us time to bond with the new fellow. Hopefully we’ll be getting him this month sometime, had a bit of a hold up due to life!